Eritrean President Isaias Afwerki was interviewed by local media on topical regional issues concerning Sudan, Ethiopia, Egypt, Turkey and Somalia on 14th January. Here are excerpts of the interview. President Isaias Afwerki was interviewed by local media on topical regional issues on Sunday, 14 January this month. Eritrea Profile is serializing Excerpts of the interview. Q: Last month, several media outlets reported that Turkey has plans to establish a military base in Sudan, in addition to its military involvement in Somalia. Many pundits maintain that the Horn of Africa is influenced by and interlinked with the geopolitical strategies of major countries in the Middle East. What is Eritrea’s perspective in this regard? What is the stance of Eritrea in regard to the developments in our region? What is Turkey doing in Somalia? Turkey is one of the powers who is vying to expand its influence in our region. To advance this ambition, Turkey uses the Muslim Brotherhood card in its operational methodology. Turkey doesn’t want to see Egypt as a regional power and its presence in Somalia is simply to assume control from the southern tip of the region. What is the reason behind the Turkish relations with the regimes in Ethiopia and Sudan? Is it really aimed at the terrorism in Somalia or to take over the country? What grounds do the Turkish have to secure a military base in Somalia? 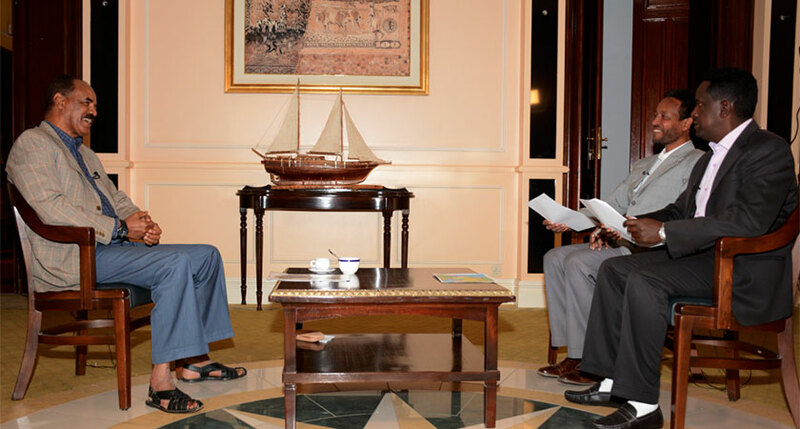 They may say they have made an agreement with the government in Mogadishu. But in reality, the military presence of Turkey or any other extraneous power in the region will not resolve the problems but exacerbate the crisis in the country. It has been proven over the years that Turkey has been using turmoil in countries such as Somalia, South Sudan, Yemen or Ethiopia for that matter, including the hot zones in the north, such as Afghanistan, Iraq, Syria, and Lebanon, to extend its influence. Turkey is one example of the “want-to-be” regional powers who are complicating domestic problems in the region in order to secure their presence and influence. Our policy in this matter is coherent and consistent. It does not stem from an emotional standpoint. For the Somali people to enjoy their sovereignty and secure the development of their country, they first need to assume control of their independence and have a government of their own, in addition to having security institutions. It is their inalienable right as a nation; no other party or power can do it for them. And for those who claim they are assisting the Somali people, the question is, what have we witnessed, what is there to show, over the last 25 years? For Somalia is to make constructive contributions in regional affairs, then its rights to independence must be asserted in the first place. There are many naval powers in the sea of Somalia. They have secured their presence under the pretext of “fighting terrorism or sea piracy”. But what the peoples of this region need; what we need is to handle our domestic matters by ourselves. Is foreign assistance needed? It is us who need to come together first and request or invite external assistance when and if needed. The result of the direct intervention or using puppet regimes to rule the area is what we have seen in Somalia during the last 25 years. In this respect, there is no need for Turkish intervention in Somalia. We have seen many African and foreign powers scrambling over the issues in Somalia…maybe Kenya, Ethiopia or Djibouti want the Somali case unsolved for their own benefits. But at whose cost? If the UN or the Security Council is still there, they need to urge these countries preying over the people of Somalia to stop intervening in the matters of a sovereign country. Q: Your Excellency, it has been reported that Turkey has plans to establish a military base in Sudan, what is your take on this matter? First of all, we need to ascertain the reliability of this information. Obviously, the government of the Sudan has every sovereign right to establish ties with Turkey; they can also allow them to build a military base in their territory. But the question that has to be raised here is, why in Suakin? The time factor, too, should not be overlooked here. As we know, the superpowers often use proxies to maintain their superiority in a specific region. And as I said earlier, Turkey is one of the regional powers who is vying for stakes in the region. What it has done in Somalia is beyond the limits of jurisdiction. Indeed, considering its geographical remoteness, how is Turkey influenced by developments in Somalia? Perhaps, developments in Iraq and Syria directly affect the security of Turkey, especially through the Kurdish dimension. But are there Kurds in Somalia? And why intend to intervene in Ethiopia, Sudan, and Libya? I don’t wish to digress into these issues. There are those who maintain that Turkey aspires to revive the Ottoman Empire from the ashes. Personally, I see this specter as shallow/childish analysis. To revert to the main issue, what agreements were exactly made with the Sudan? Is Turkey really planning to establish a military base in the Sudan? Our analysis must be based on verifiable fact; not on press clippings. In my view, these news reports are merely peddled for public relations consumption. On the other hand, if matters go beyond that; beyond what we know so far, then they will provoke major questions. What messages is Turkey trying to send by standing on Sudan’s side, while tensions prevail with Egypt? If we take the scenario that Turkey is building a major military base in Suakin, then what is the mission of the army? We don’t need to make premature statements or analysis concerning this case; but if true, it would not be acceptable. Such intrusion cannot be justified. From our experience, many false allegations have been said about Eritrea: allowing the Israelis and Iran to build military bases in Dahlak; the existence of Israeli surveillance station at Emba Soira etc… But what do these news networks gain from disseminating these baseless allegations? So one has to be cautious to differentiate fact from fiction. The strategic importance of Bab-el-Mandeb, the Red Sea, and the Suez Canal as international water channels is evident. Within this broader picture, what does Turkey want in this area? We need to look into how this could affect our sovereignty and security; both in its national and regional ramifications. In any case, we do not wish to jump to conclusions. We have to monitor developments closely. The Weyanes are also playing their negative role in this regard. Be that as it may, we need to look at these developments from the broader foreign policy perspective towards our neighbors. We can even ask the Turks what they are doing in Suakin if they are willing to share information candidly. Q: Mr. President, Ethiopia is in tatters and overwhelmed by political crisis. Conflicts are transpiring regularly within and among the ethnic regions/kilils; mass protests are directed against the government, and the ruling party is engulfed in spiraling internal strife and acrimony; with reports of deep divisions. Where is Ethiopia heading? The situation in Ethiopia concerns us more than any other case in the region or the neighborhood for an evident reason. What has been done over the years? I read a joke in the news very recently that the Ethiopian parliament, meaning Weyane’s parliament, has established “an inquiry group to investigate the conflicts between two ethnicities”. We can look at the contents of Article 39 of the constitution of the Federal Democratic Republic of Ethiopia. This brings us to Weyane’s number one agenda; that they want Ethiopia to be plagued by perpetual ethnic strife. If we ask what has transpired in Ethiopia over the past 25 years, the answer is simple; destruction of the country that emanates from the regime’s divisive policies. When our ties were good in the early 90s, we used to discuss paramount matters that affect the destiny of the two brotherly peoples; because the future of the two peoples is interlinked. We have fought and sacrificed together. Early on, during the liberation struggle, the TPLF’s agenda of the self-determination of Tigray was, for them, independence. We kept telling them that this is not right; [however] they kept on emphasizing that they don’t want to live together with the Amhara. This was dropped later but apparently, they felt that as they were a minority in numerical terms, they can only rule Ethiopia by driving a wedge and conflicts amongst the other constituent ethnic groups. This agenda was a dismal failure. The “Progressive” Constitution of the Federal Democratic Republic of Ethiopia was drafted against this backdrop. The overarching state of mind behind this framework was the institutionalization of ethnic cleavages in Ethiopia to make it easier for the TPLF to rule the country. Before the EPRDF was even formed, and other forces were around, we used to tell them that this is not the right way. In 1991, we told them to have a transitional constitution for the Ethiopian people to know where they were headed. We were not meddling in their case at the time. Because we were partners, we envisage at least 10 years of transition period. The EPRDF was for them a mere umbrella; not a veritable vehicle for cultivating unity. Now forming an “inquiry committee” to investigate the cause of the conflicts is really risible. I was one of the first people to look at the draft of the Constitution of the Federal Democratic Republic of Ethiopia (because of our good ties at the time). I maintained from the outset that the inclusion of Article 39 allowing ethnic self-determination up to secession was misguided. In a country of ethnic diversity, instead of organizing their unity for a developed nation, they disregarded the gravity of the situation and kept it as an organizational structure. It is a very dangerous game and the key architects behind this dangerous game were the Weyane regime. Weyane have committed four major mistakes. Dividing the people of Ethiopia was a strategic folly. Monopolizing or controlling was another grave error. Putting the resources of the country in the hands of a few people mostly representing a certain ethnic group is very dangerous. They made campaigns in the US and Europe, proclaiming that Ethiopia is lucrative for investment; that it was registering double-digit economic growth; they indulged in the reckless selling of the lands. All these led to the prevailing situation. What is the status of Ethiopia’s economy at the moment? It is not what the IMF or the World Bank have advised to [revive] the economy by devaluing the Birr, the country’s legal tender. How can an economy that registered a double-digit growth be in such ailing conditions? The third agenda was controlling the military and security. How did the current security problems in the country unfold? They didn’t even need to have the military or security to live in peace with Eritrea. A mutually-friendly grounds for peace and security was all that was needed. There was no reason for them to go to Somalia or wage a war with Eritrea from the beginning. The government’s fourth agenda was to control the situation by relying on or becoming subservient to foreign powers. This inevitably engenders dependency. They felt they could rely on external powers to control the domestic situation at home and to betray and victimize Eritrea. What has unfolded in the last 25 years demonstrates the gross errors committed by the TPLF regime and its international partners. If we closely examine the government’s policies on politics, economy, security, and foreign policy, the blatant mistakes are clear. The turmoil we see today was not triggered by a single factor; rather it is the accumulated outcome of years of miscalculations in internal and external policies. Looking back to the past, we can refer to the Clinton, Bush and Obama administrations’ role in the unfolding crisis in the country. They are responsible in many ways for encouraging a government that was never ready to lead a country responsibly. Where were these administrations when such shambolic policies were being drafted and consequently implemented to devastating outcomes by the Ethiopian government? Why were European government giving a deaf ear to the early warnings coming out of the country? In truth, we cannot just grasp the current unstable climate in the country from internal agendas of the government, but we as well have to shed a considerable amount of light on external and foreign agendas. The government is not capable of handling or delaying such a dire condition for a long period of time. It simply doesn’t have the capacity to do so. The biggest obstacle was the political and economic injections that were made to delay the unfolding circumstances. Major investments were made in the country; in return, these injections not only created the crisis we are witnessing today, but they also played a major role in keeping it under wraps for a long period of time. However, the “intensive care” that was provided could not postpone the inevitable crisis for an indefinite period. The political, economic, security and foreign relations that were said to be positively harnessed over the last 25 years were a slippery slope for Ethiopia. They were misled by Washington and European counterparts. Over the years, we saw the government of Ethiopia disregard the history they shared with the Eritrean people. We were betrayed and every tactic imaginable was deployed to erase our entire history. Attempts were made to put a wedge between the good people of Eritrea and Ethiopia. Twenty-five years have been lost and the opportunities for development and stability that were squandered were immense indeed. But we regret nothing. The good relationship between these two countries will never wither. The government is perhaps in its last straw as it strives to hold a tight grip on power. Assurances of political and economic reform are pronounced every day. Talks of the release of political prisoners are said to be underway. More promises are being made to resolve the ethnic-based political representation, all of which are nothing but false promises made to keep the current government in power and minimize the severity of the crisis. All these efforts notwithstanding, the TPLF has come to the end of the road; It is Game Over! Q: As a result of the current crisis in Ethiopia, how can it influence Eritrea and the Horn of Africa? Bearing this in mind, how can we proceed on revitalizing the relationship between the people of Eritrea and Ethiopia? The background is like I stated above. We cannot restrict ourselves to seeing the relationship between the two people of these countries. After the end of the Second World War, the Ethiopia fable was created. Ethiopia annexed Eritrea, Ethiopia did this and that…but Ethiopia is not the only one to blame. This is not to undermine the then government of Ethiopia, but it was never a decision made only by Ethiopia. At the time, just like every other colonized African nation that declared independence, it was also the people of Eritrea’s inalienable right to declare their own independence. But that was not granted to our people. The new world order of the time created a whole different political climate in the Horn, under the pretext of the Ethiopian fable. For the Eritrean people, it was decided to annex them with Ethiopia. And when we were denied our chance and basic rights to create a sovereign nation, we turned to an armed struggle and we paid heavily to realize our independence. In the past 25 years, the dream of creating one great hegemonic Ethiopia in the region has continued. After independence, both peoples of the countries worked together to further their cause for development and stability. What should have happened after the Second World War was realized a full 45 years later. But had we got our independence at the dawn of the end of the Second World War, and had both countries continued on the path of mutual development cooperation, the price that was paid, the opportunities that were lost to both countries as a result of Eritrea being denied its sovereignty, would have been completely avoided. It was for this reason that both countries entered a struggle: to correct a mistake and create a stable and developing region in the Horn. Especially after the Derg came to power in the 1970s, the efforts made by both people was remarkable and it is duly recorded in the history books of Africa. After independence, using the good relationships we had forged on the battlegrounds, we set out to continue our extraordinary relationship towards realizing the full potential of this region. We talked about embarking on a journey to help our neighbor Somalia and to set up a powerful coalition of nations. In 1993 we concentrated on strengthening the region first, then set out to form international relations. If we examine history, both people always enjoyed mutually-and strategically-beneficial relations. These were never based on an outcome of political powers. As I had mentioned above, the government of Ethiopia has created this distortion of historical values over the years and this has to be returned to normal. Creating a climate of disdain between the two people of these counties cannot amount to anything good or productive. But by working together, the results that we can achieve on all fronts… politics, economy, and security… the diplomatic relations we can possibly form with our regional neighbors, as well as international friends, can be formidable and beneficial for both countries and the Horn of Africa. This is not an option. This has to happen at any cost. The people of Ethiopia defiantly have to reevaluate the future of their country and decide how they will proceed without any intervention from external powers. Without a doubt, there definitely has to be a transitional period for this to happen. At the moment, there are different factions working under the EPRDF and outside it. For us, it is not about taking sides. For both countries to fully be able to seize future opportunities, first the current crisis in Ethiopia has to be straightened out. The misguided policies of the Clinton, Bush, and Obama administrations in Ethiopia, Somalia, South Sudan, and this region, in general, played a negative role and has to stop. There is no reason that European countries and others such as China and Russia, who are trying to play a new role in this region, cannot help in harnessing a progressive outcome. What we proceed to do in this New Year has to be planned and calculated in a way that will best benefit this region. We also have to take the current issues in South Sudan and Somalia into consideration. In the case of Djibouti, the problem was with the former administration. The administration that came after the late Gouled had a notion of making the port of Djibouti the largest in the region. And for them, they were under the assumption that as long as Eritrea and Ethiopia were at loggerheads, this was achievable. This is simply a narrow-minded thought. For this region to prosper and develop in the future, all nations have to come together. Egypt, Saudi Arabia, all our wide neighbors across the sea have a vital role to play. Each country has its own sovereignty and independence to preserve. In the end, we all have mutual benefits to gain and just like we are ready to work together with the people of Ethiopia, there is no reason others can’t join as well.